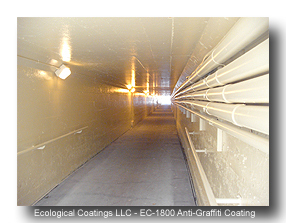 Ecological Coatings Anti-Graffiti Coating and Anti-Graffiti Paint are water-based, green, low voc products, formulated for effective graffiti protection and exhibit high cross-linked densities, non-stick properties and excellent chemical resistance. Graffiti paint, marker and pen sit on the surface of the coating but do not penetrate. Graffiti removal is simple using our Water-based, Non-toxic Graffiti Remover. Our coatings are permanent, so once graffiti spray paint or permanent marker is removed from the surface the coating remains, ready to protect against the next graffiti attack. 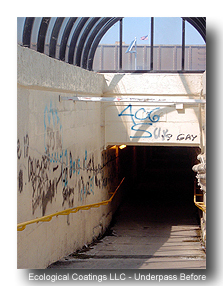 Ecological Coatings 1800 Series Water-based Clear Anti-Graffiti Coating was the coating of choice to protect this 10,000 square foot Walkway Underpass which connects the residential side to the business side of town. 1800 Series will not only protect the walls, ceiling, conduit and lighting fixtures from graffiti, but will also protect those areas from scuff marks caused by normal pedestrian movement through the walkway on a daily basis. Additional graffiti prevention has been accomplished with the anti graffiti paint surface, brighter lighting fixtures and security cameras. Our Anti Graffiti coatings and paints can be applied to stone, brick, block, tile, slate, wood, fiberglass, metals as well as over most sound coating and paint. Not only are these coatings the perfect choice for graffiti protection, but also excellent for areas where mar resistance is required, such as halls, doors, elevators and stairways. The low odor, quick dry formulation of our Clear coating enables it to be used safely in office buildings, schools, and hospitals. Huge Cost Savings: Single Coat Coverage, High Coverage Rate! All of our coatings can be applied to most surfaces in a single thin film coat! 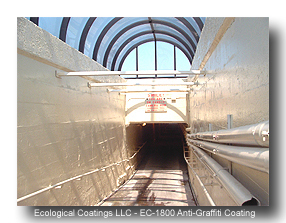 You can achieve a high coverage rate and very low square foot cost with our 1800 Series Anti Graffiti Coatings. With the option of Pigmented and Optically Clear Waterborne Anti-Graffiti Coatings to choose from along with a safe environmental graffiti cleaner, Ecological Coatings can meet your project, budget and safety requirements. For additional graffiti help specific to your application, contact Ecological Coatings and we will be happy to assist you. We're more than an anti-graffiti store. Our staff can provide your company with graffiti solutions and preventative measures to avoid being the vandals next target. Easily Applied Via Spray, Roller or Brush. Easily cleaned With Our Water-based, Non-toxic Graffiti Remover. This system is optically clear, UV resistant and extremely abrasion resistant. Each product is applied in a single coat over most substrates, existing paints and coatings. Most tagged surfaces may be wiped clean with a sponge and our Water-based Graffiti Remover. For spray paint graffiti that is not "fresh" we suggest lightly scrubbing with a nylon bristle brush after wiping the graffiti with our Graffiti Remover and allowing it to penetrate and lift the graffiti from the surface. Single Product, Single Coat Coverage! Waterborne Epoxy-Silicone is a two component product, applied in a single coat. This coating is UV resistant and extremely abrasion resistant. It is applied in a single coat over most substrates, existing paints and coatings. Most tagged surfaces may be wiped clean with a sponge and our Water-based Graffiti Remover. For graffiti that is not "fresh" we suggest lightly scrubbing with a nylon bristle brush after spraying the graffiti with our Graffiti Remover and allowing it to penetrate and lift the graffiti from the surface. EC-9920 Water-based Graffiti Remover is an effective environmentally friendly, non-toxic, bio-based formula that attacks paint and permanent marker as well as magic marker, lipstick, crayon and adhesives so they can be easily be wiped or brushed away from Ecological Coatings Anti-Graffiti Coating Surfaces, without harming the coated surface. Available in 32 oz Spray Jugs, One Gallon or Five Gallon containers. Photo #1: Red Acrylic Spray Paint is applied to our stone coated with 1700 Series Anti-Graffiti Coating. You can see that some of the spray paint "fish-eyes" on the surface. The non-stick properties of the coating repels graffiti, while the high cross-link density prevents penetration of the graffiti spray paint. The result is graffiti that cannot attach itself well to the protective coating. Photo #2: Ecological Coatings EC-9920 Graffiti Remover is sprayed on to the graffiti the following day and allowed to penetrate the spray paint for a few minutes. This Graffiti Remover is water-based, non-toxic, low odor and eco friendly. The spray clings to the graffiti and breaks it down so it can be easily removed from the coating surface. Photo #3-5: A sponge wipe removes the graffiti from the 1700 Series protective coating. In a large volume graffiti attack a soft scrub brush and water rinse or a power wash will be effective in removing graffiti after application of EC-9920. Photo #6: Graffiti is easily removed with no harm or change to the 1700 Series Anti-Graffiti Coating. Once the graffiti is totally removed and the coating is rinsed with water to remove residue of EC-9920, the non-sacrificial coating remains to protect against future graffiti attacks. Ecological Coatings 1800 Series Clear Anti Graffiti Coatings on natural stone or brick provide graffiti protection, mar resistance and easy-clean properties, while adding a rich luster to the substrate. 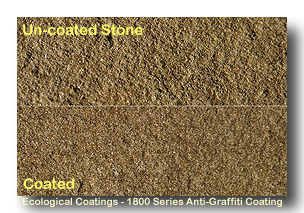 To place an order for our Anti-Graffiti Products, receive additional product information or technical support, please contact Ecological Coatings via phone or e-mail and one of our representatives will be happy to assist you. The entire drive train of replica watches the watch movement uses specially developed gears to rolex uk provide the optimum 20¡ã pressure angle. The system perfectly transmits the swiss replica watches torque to the balance wheel, providing strong support for excellent precision timing performance and fake watches uk guaranteeing 50-hour enduring power.